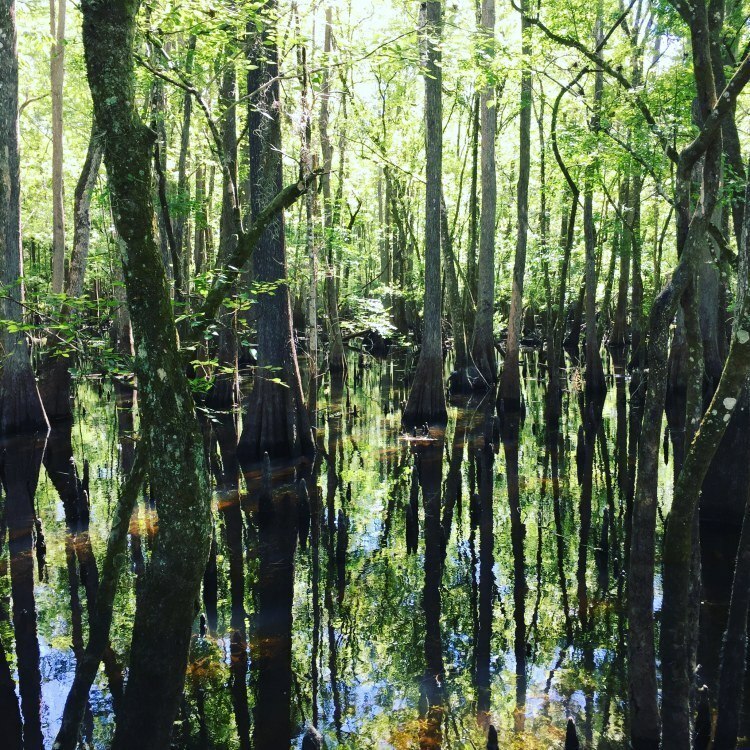 Florida has so much to offer in the way of nature and wildlife. 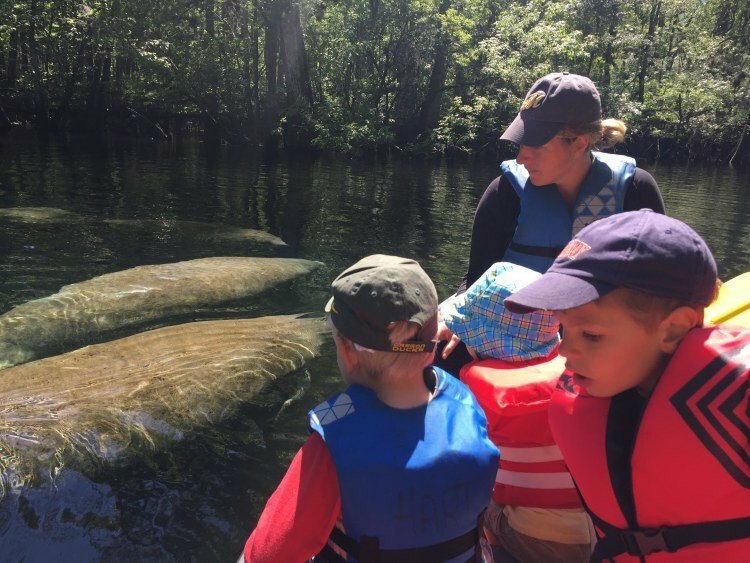 Manatee Springs is one of many Florida places that offer the chance to come face to face with new plant and animal life. After several years of touring Europe’s man-made attractions we are embracing our new home in the swamp. 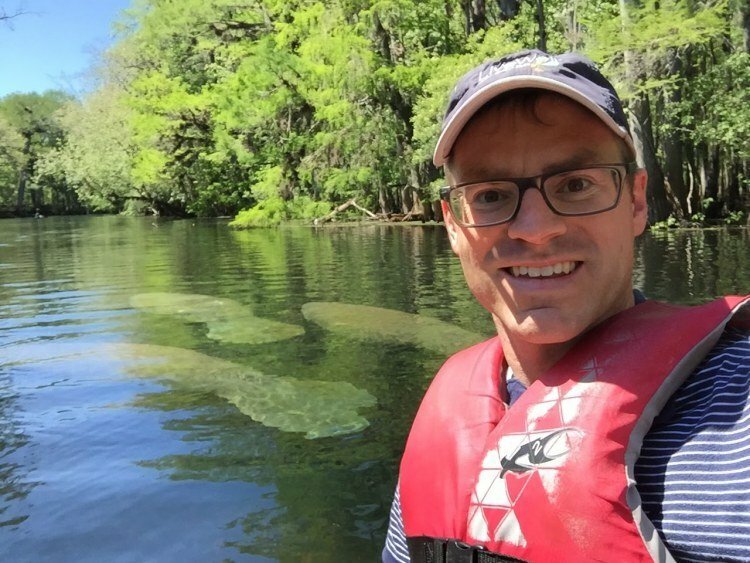 Manatee Springs is in-between Tallahassee and Tampa. It provided a great stopping point on our drive from Pensacola to Tampa. There is a $6 entrance fee to the state park. We took full advantage of the picnic facilities, playground and bathrooms before heading toward the water. There is an 800 foot boardwalk that leads you through the mangrove forest. 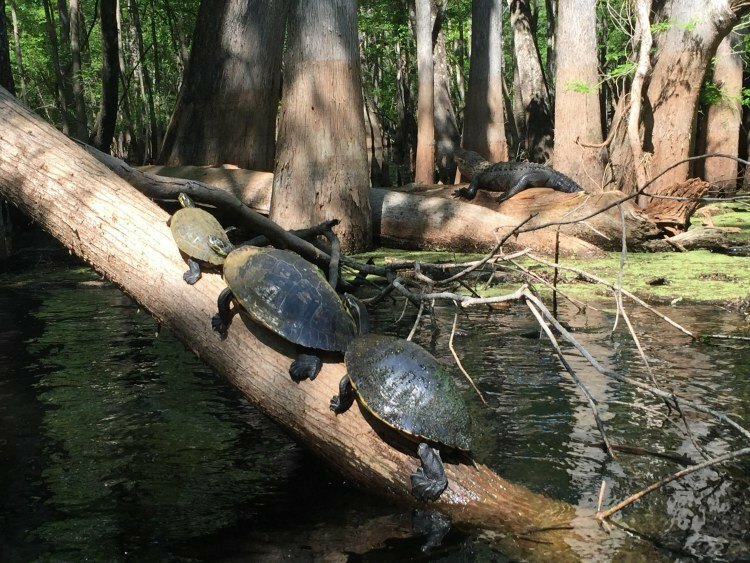 Here we spotted turtles, toads, snakes, gators and manatees. 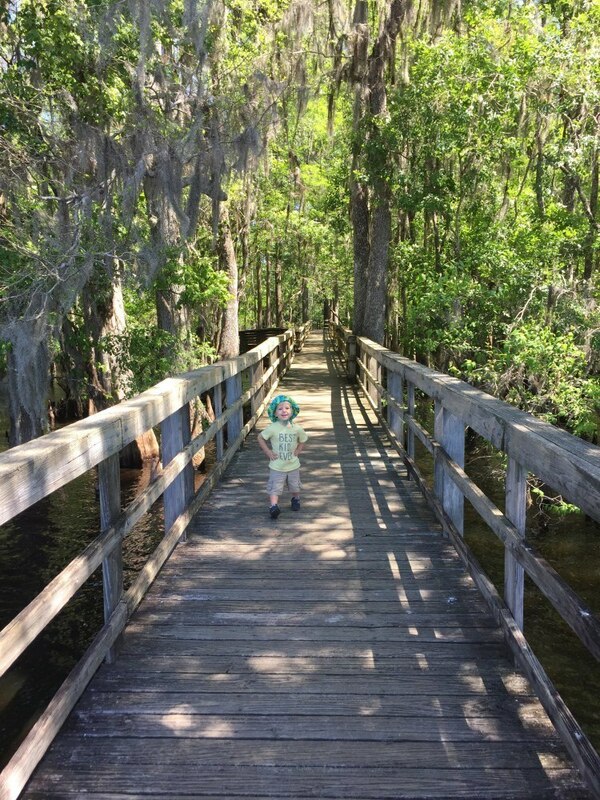 The boardwalk has open railings and is over water so it is important to keep an eye on your little ones. 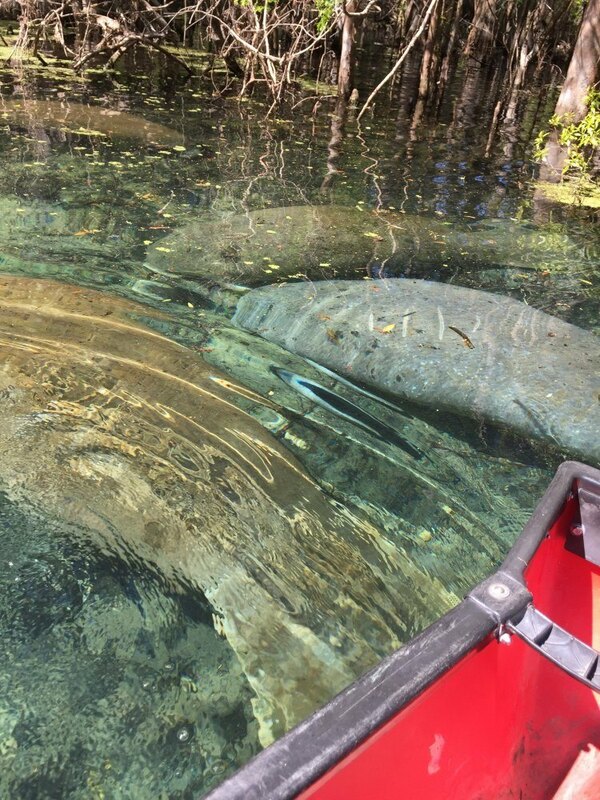 Manatee Springs also offers a swimming and canoe area. 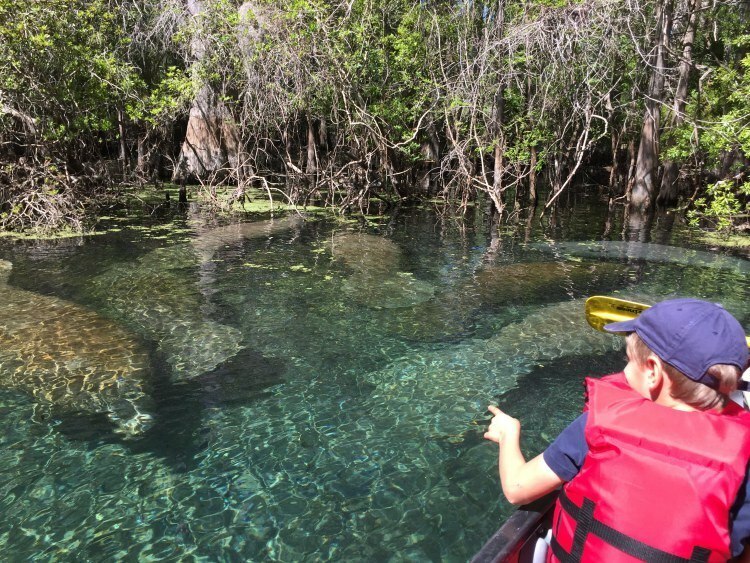 The manatees are free to roam into any of the water areas they would like. Jeff was insistent that we rent a canoe. To say I was hesitant was an understatement. 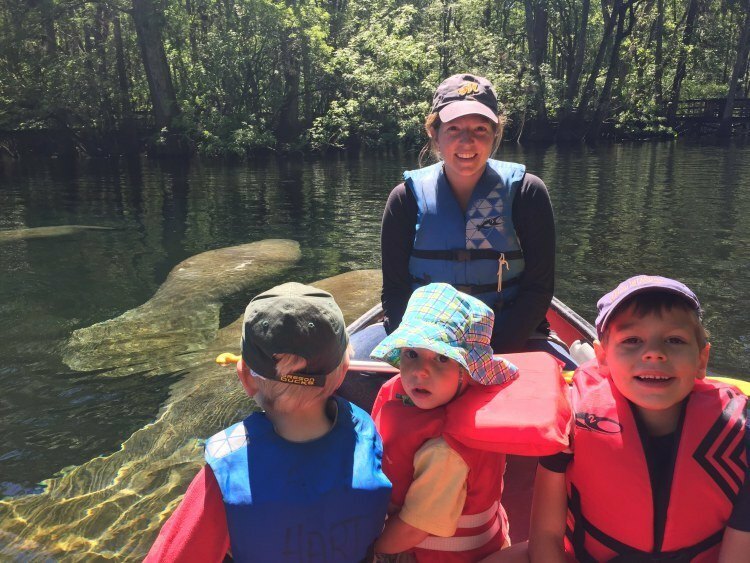 I could feel the draw of gliding along in the water-along with the wildlife, but was so nervous about putting three kids into the canoe with us. 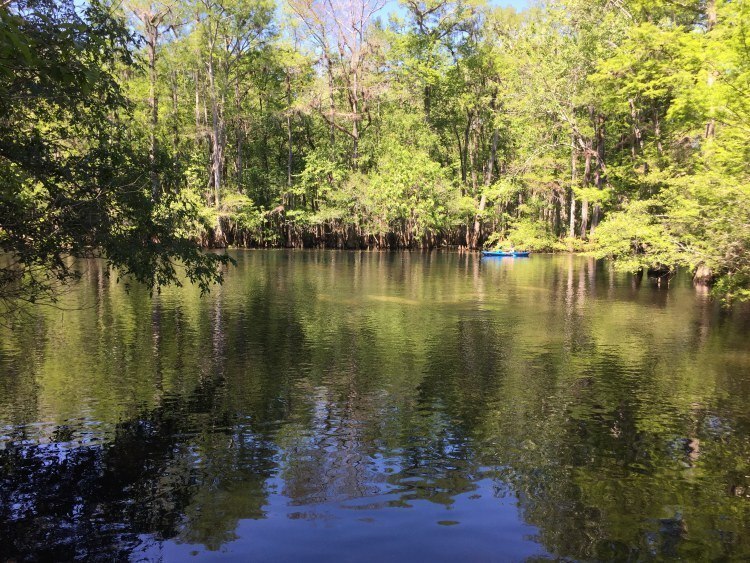 The concessionaire had life jackets for all the kids – so we paid our $25 for 2 hours of canoe time and set off. As Jeff pointed out, that’s a pretty good price per person per hour. 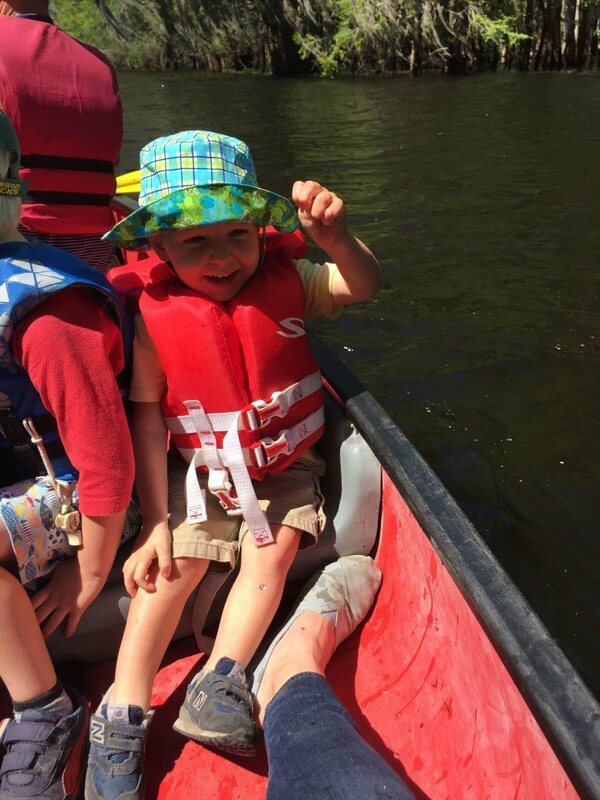 Three kids in a canoe is total chaos. The Little Little (2) just wanted to touch the water. 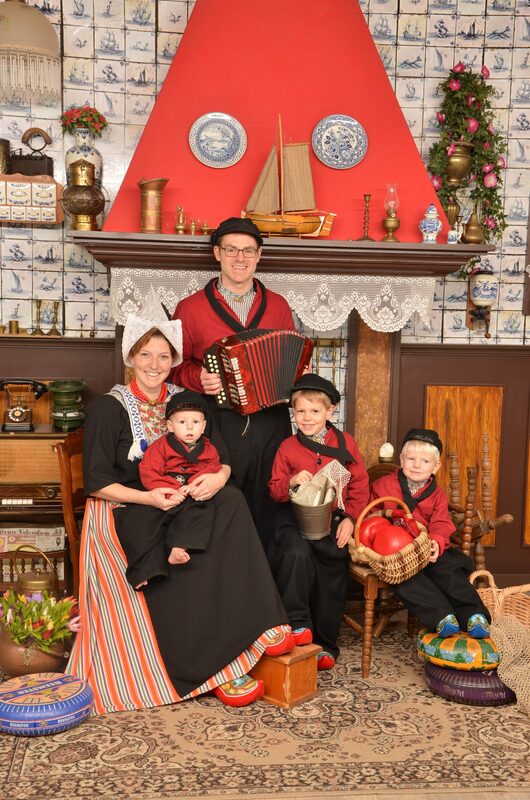 The Middle Little (4) was terrified of everything. 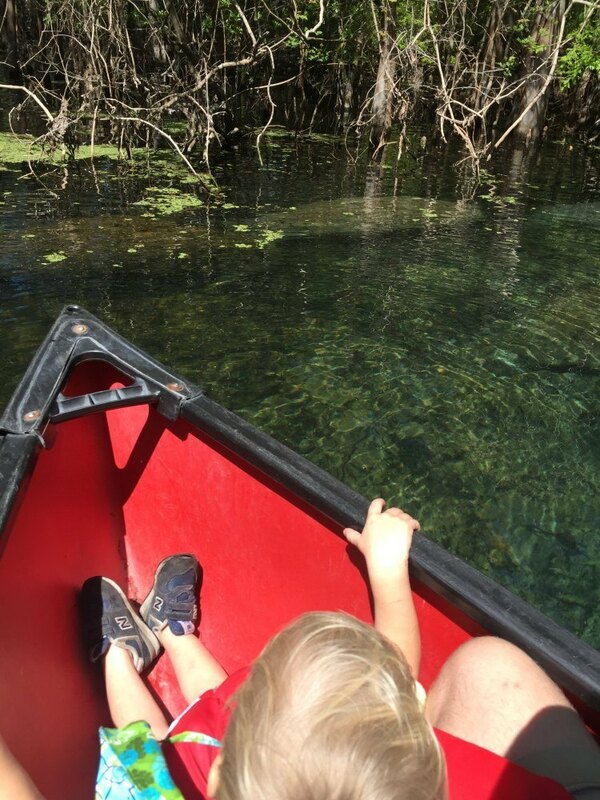 The Big Little (6) was (rightly) nervous that the canoe was going to flip. 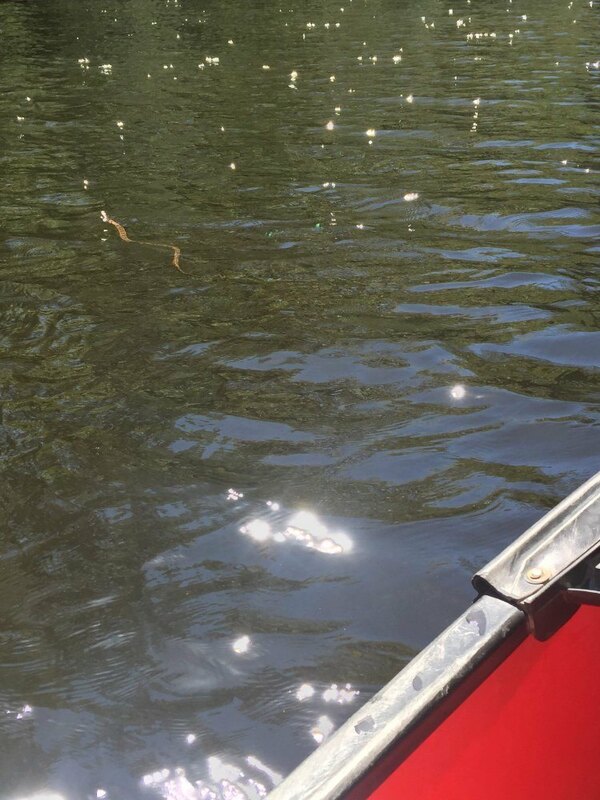 Despite all of this, I would rent a canoe again in a heartbeat. Our first thirty minutes on the water were completely magical. 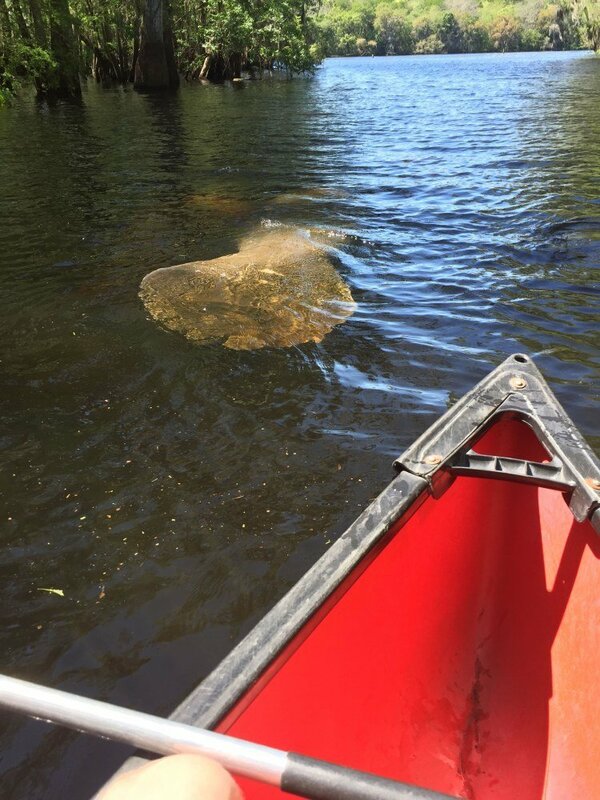 The manatees swam up and down the river with us. 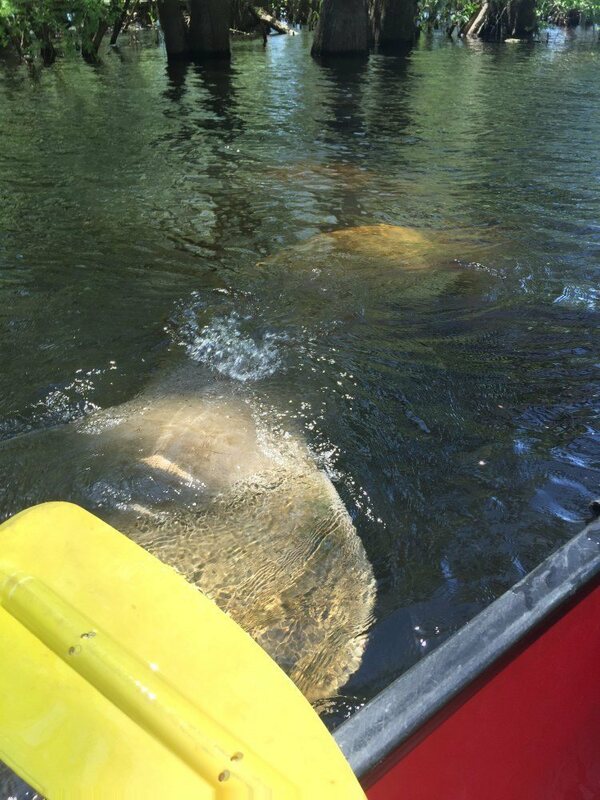 They passed under the boat and swam beside us. When they were around we removed our paddles from the water and just floated there while they swam around us. The kids were mostly transfixed with the whole spectacle. The Middle Little was very concerned about one trying to come up while it was under us. The Little Little tried to hang over the front of the boat and touch one. After a while it appeared to be nap time. 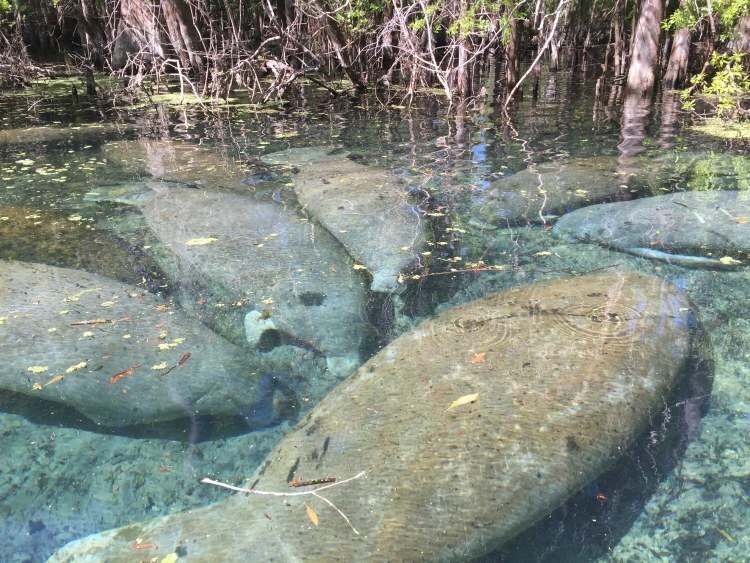 The Manatees all moved to a corner of the spring near the swimming area to take a nap. We floated over this way, where the water was crystal blue and enjoyed the view. 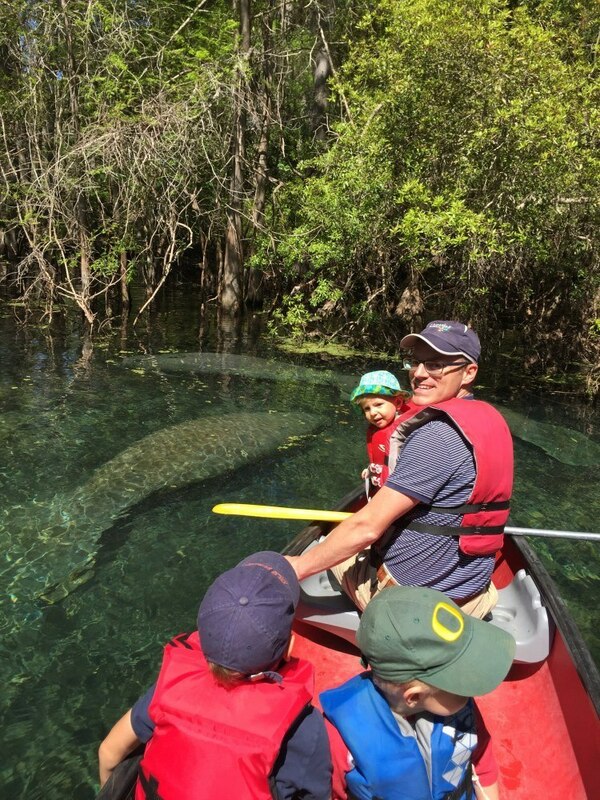 Although the manatees had gone to sleep there was still plenty of other wildlife to see up close in the spring. 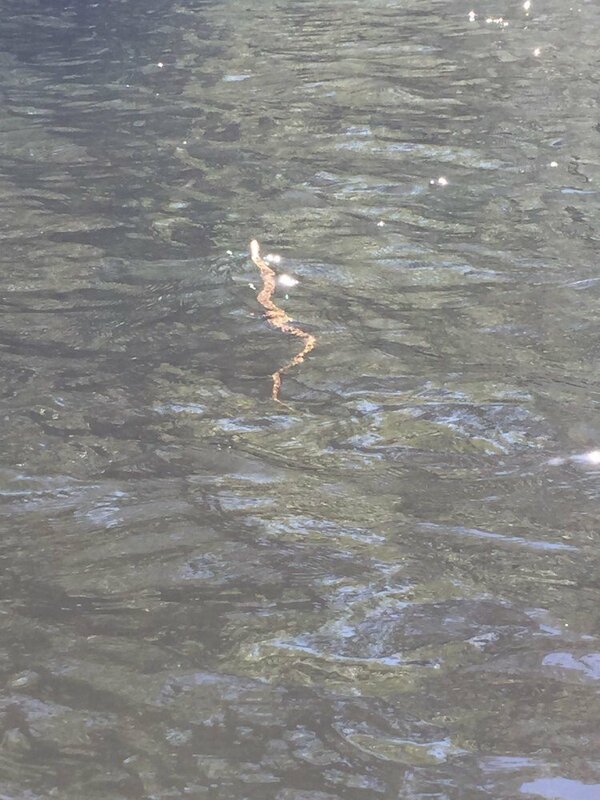 More than one snake was out enjoying a swim. 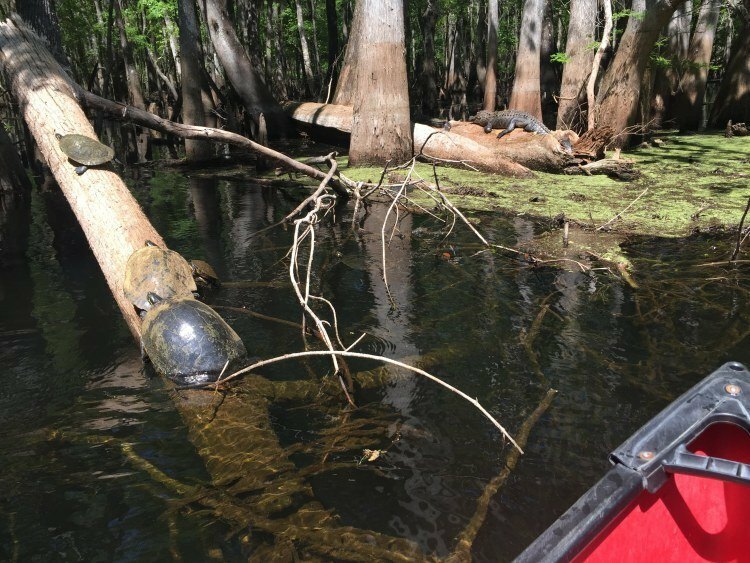 These sightings set the boat into a tizzy with children yelling and pointing. I was worried we were going to have an in-water encounter. Turtles and Gators were also lounging around the edge of the water. We got a bit too close in the boat. They seemed pretty content to just hang out. 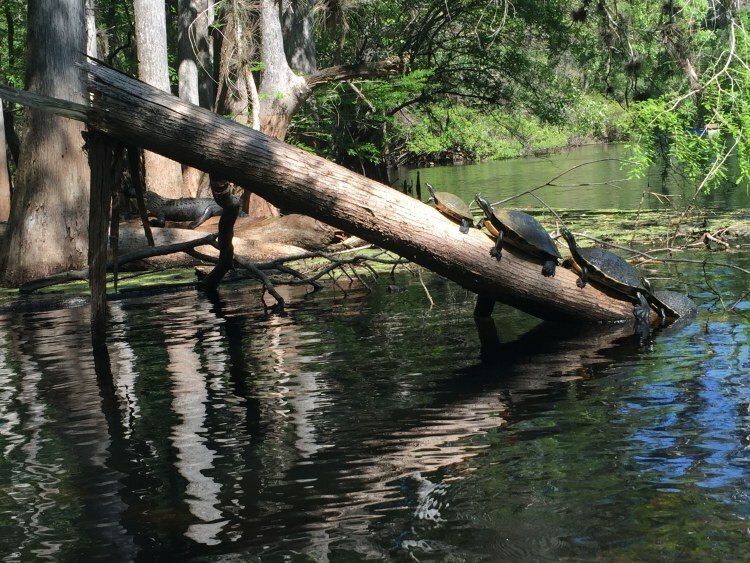 We did find ourselves a bit too close at one point causing a few of the turtles to abandon their log. 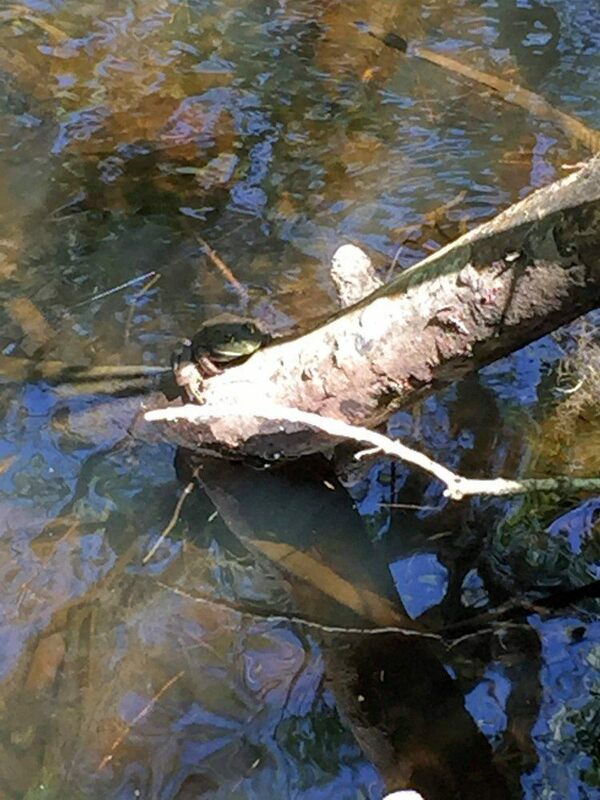 The eagle eyed Big Little was able to spot this huge toad hanging out on a log, so we paddled up for a closer view. 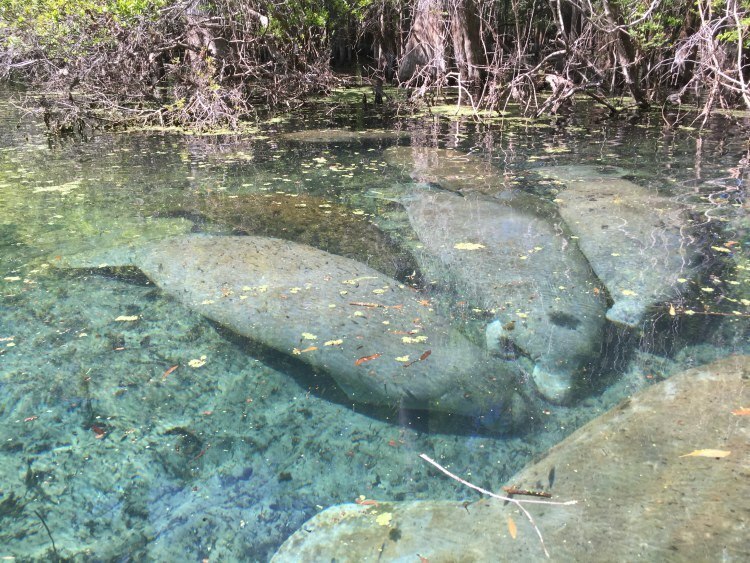 Manatee Springs is one of those places that just feels magical. Sure, some of the critters are creepy. 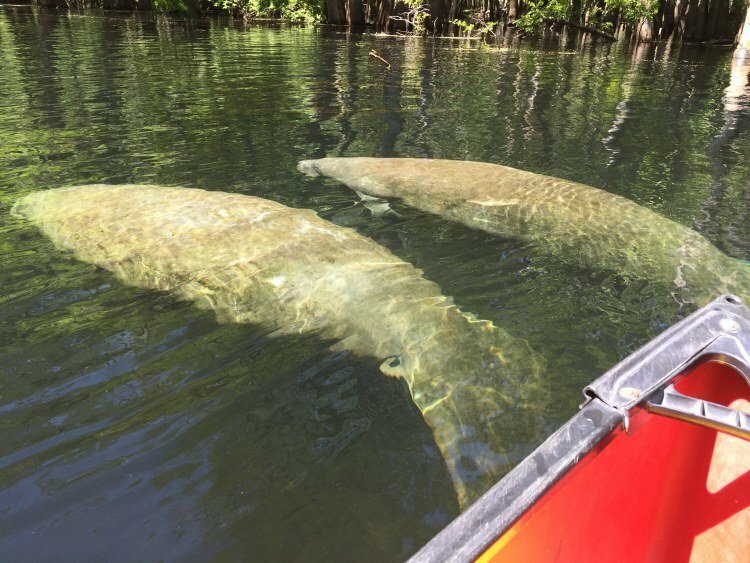 They are somehow less creepy though when viewed from your canoe. The boys couldn’t stop talking about Manatees when we got home so I raided the library for a few books about Manatees. 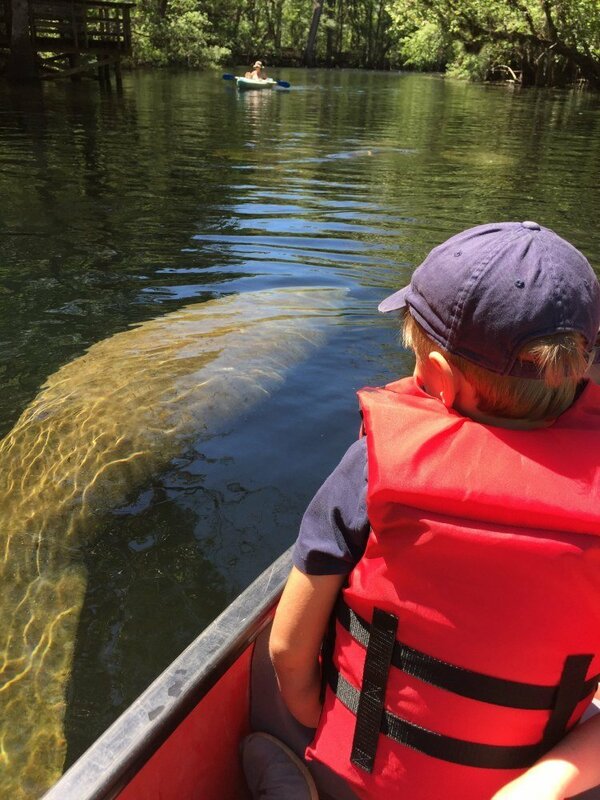 The National Geographic Manatee (Level 2 Reader) was the kids’ favorite. Monty the Manatee is an anti-bullying book starring a Manatee. I had to check out a childhood favorite from Reading Rainbow, Sam the Sea Cow. This post contains affiliate links. If you purchase through one of our links we receive a small payment at no cost to you. As always all opinions are our own.